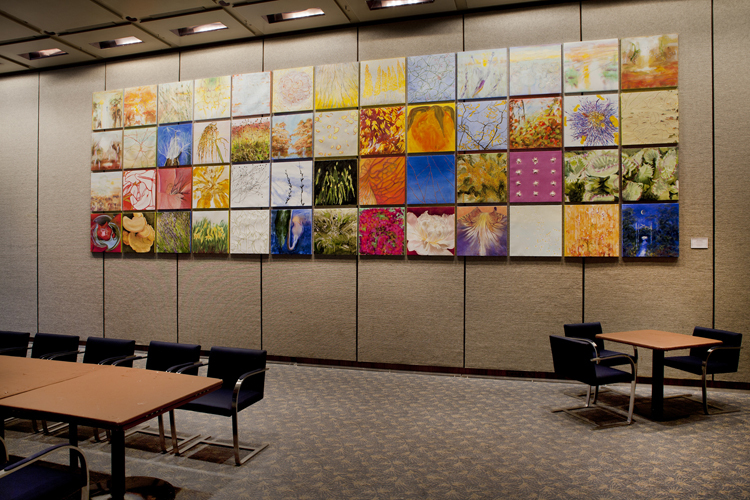 52 Weeks II, a series of paintings created over the course of a year by Roy Nicholson, has now finished its run at The Four Seasons restaurant, in the landmark Seagram Building at 99 East 52nd Street in Manhattan. The exhibition was extended for an additional three months beyond its one-year scheduled showing. It was installed in the Terrace Room, on the same wall once occupied by Jackson Pollock’s 1952 masterpiece, Blue Poles. The series comprises 52 paintings, each done during one week, from the summer solstice of 2008 to the summer solstice of 2009. Much of the imagery is based on elements of the artist’s garden at his home and studio in Sag Harbor, New York. All four seasons are represented, although not in strict chronological order. Organized by John Woodward, director of the Woodward Gallery and a former Four Seasons chef, the installation of 52 Weeks II was a feature of the venerable restaurant’s signature art program. During its 62-year history, it has hosted works by many contemporary artists, including Joan Miró, Frank Stella, James Rosenquist and Robert Indiana. Distinctive permanent pieces include a large Picasso stage curtain designed for the Ballet Russes, and a Richard Lippold hanging sculpture over the front bar.